Ratios are implemented to encourage people to give while they receive. For example, if you want a user to get 1 byte of download for every byte they upload, the ratio is set to 1/1; 1 byte upload for 2 bytes to download makes a ratio of 1/2. If they upload a file of 100 bytes at a ratio set to 1/2, they will have 200 bytes for credit but only 50 bytes if the ratio is set to 2/1. The ratios apply to files uploaded or downloaded across sessions.The ratio will be calculated using the number of files uploaded or downloaded. The Credit amount applies to all users of all sessions using this account and it is remembered by the server between sessions. The ratios apply to files uploaded or downloaded across sessions. 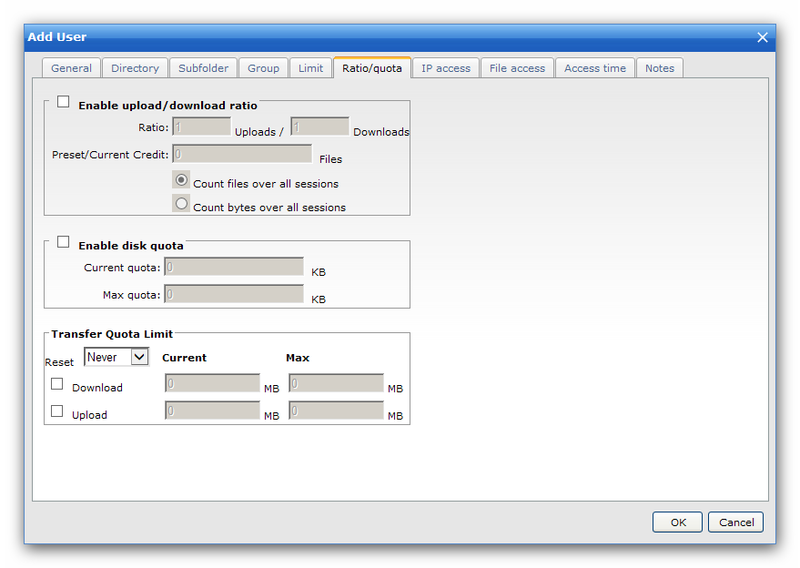 The ratio will be calculated using the number of bytes uploaded or downloaded. The Credit amount applies to all users of all sessions using this account and it is remembered by the server between sessions. This is feature allows you to set the maximum space each user can use on your server. A user cannot upload if he exceeds his quota. Then he needs to delete some files. If a user's quota is zero and he deletes a file, his quota remains at zero. The limit will be reset every selected period. As a hosting company, you could allocate your user a maximum traffic per month using this option. Maximum MBytes that can be transferred.